The Soylent products are eaten by the species it is made from and a reference to the film Soylent Green. Soylent green are green cubes often used in cooking. 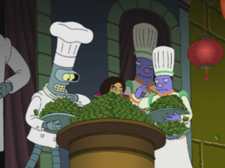 They were used in the Iron Chef cook off between Bender and Elzar. Ethan "Bubblegum" Tate said, "Soylent green is my kind of people" after trying soup from Elzar. Soylent chow is dog food made from dogs with the slogan "It's a dog-eat-dog world". Soylent coleslaw is coleslaw made from people. Soylent orange is probably an orange-flavored Soylent product. It can be eaten in slices. Soylent Majority is made up of the starving masses who protested to President Nixon due to his alien-proof fence ruining the economy. This bold solution helped Nixon both be rid of angry protesters and be able to feed the remaining population of Earth. Manufactured sometime between 3012 and 3028. This page was last edited on 5 February 2018, at 00:37.